Yesterday I visited Birmingham with my family, where we were given lunch by Matthew Doyle, the Birmingham Representative of the Latin Mass Society, and his family. After lunch Matthew and I had a little tour of John Henry Newman's room, and other places of interest in the Birmingham Oratory, where we were the guests of Fr Philip Cleevely. I know the London and Oxford Oratories well, but this was my first visit to the Birmingham Oratory. 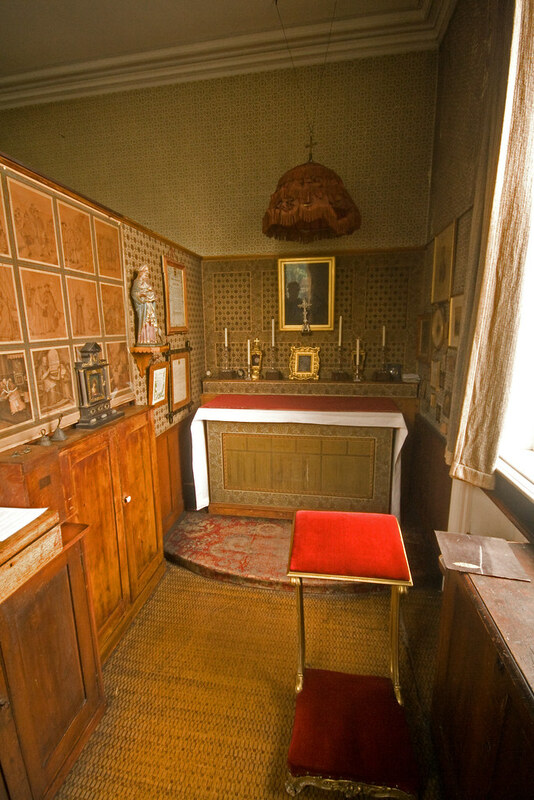 In light of Newman's forthcoming beatification it was a particular privilege to see Newman's room, where he worked and slept, until he was a cardinal; at that point he was given a separate bedroom, and part of his old room became his private oratory, and the rest remained his study. It is to a remarkable extent exactly as he left it. 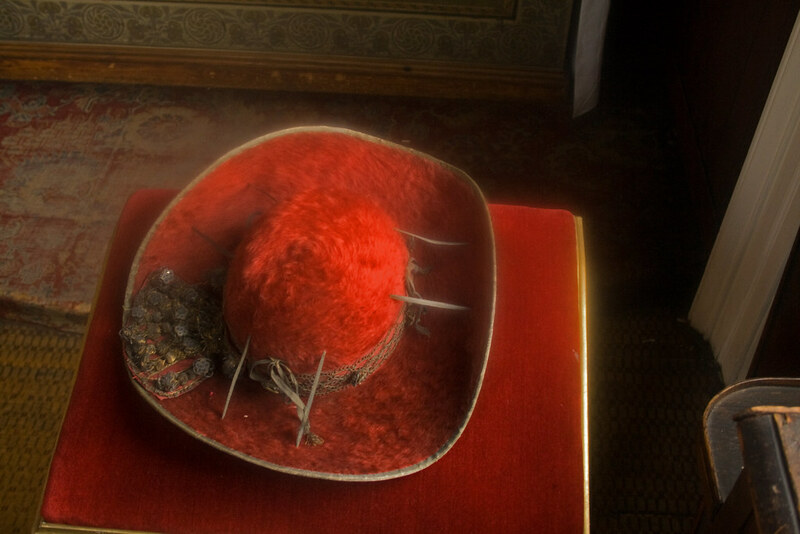 Among the fascinating personal items of Newman which can be seen there is his 'soup-plate' hat, red for a Cardinal and with gold braid on it (properly a Capello Romano, or Saturno). Newman had a great devotion to St Francis de Sales, and one wall of the little chapel is decorated with etchings depicting his life. There is also a painting of St Francis over the altar. 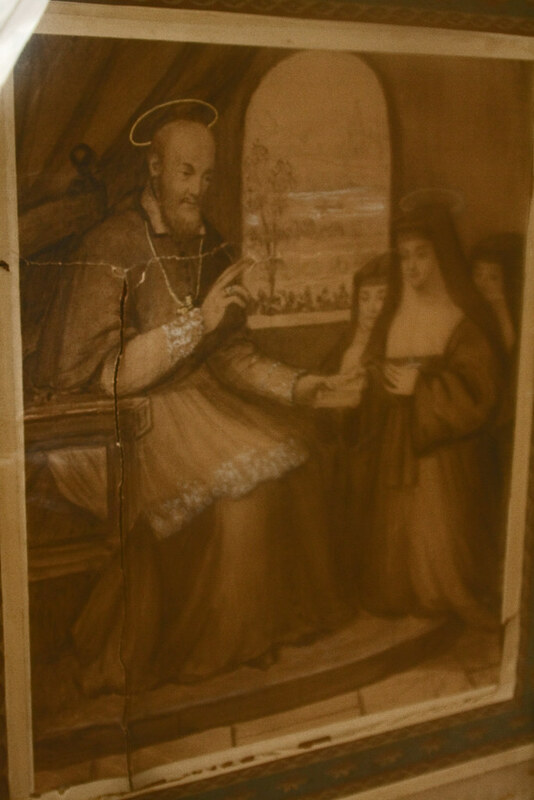 Here is St Francis giving a Rule to St Jane Frances de Chantal, with whom he founded the Order of the Visitation. There is also a highly practical and space-saving vestment press. 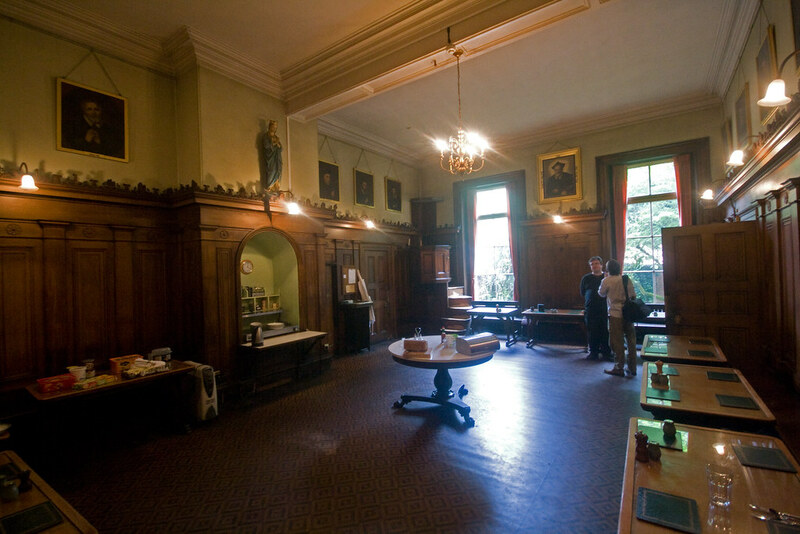 Fr Philip also showed us the library and the refectory, both of which are as Newman knew them. While the church was rebuilt (as a memorial to him, in fact) after he died, the Oratory House is essentially unchanged. 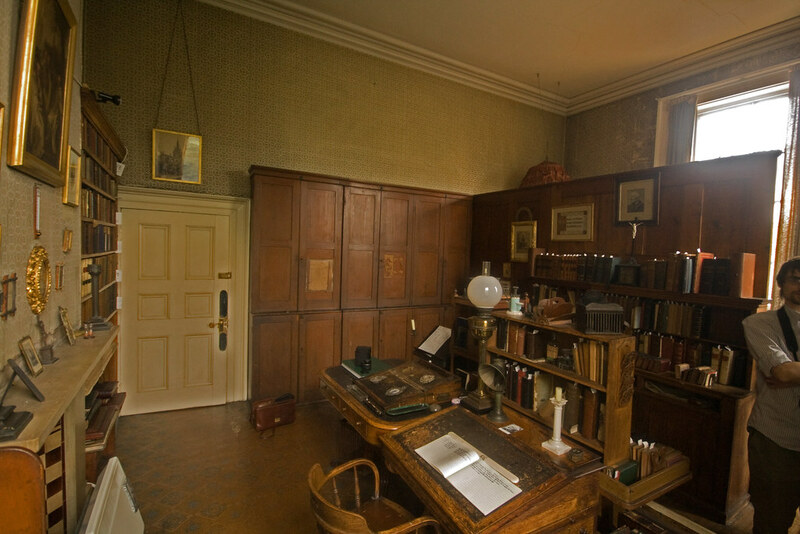 Newman used the desk on the right, below, to write the Apologia (although it wasn't at that time in the library). There are some more photographs in my Flickr set here. Readers may remember my post about a book inscribed by Newman, which is here. On July 6th the Holy Father received the Superior General of the Priestly Fraternity of St. Peter, Very Rev Fr. 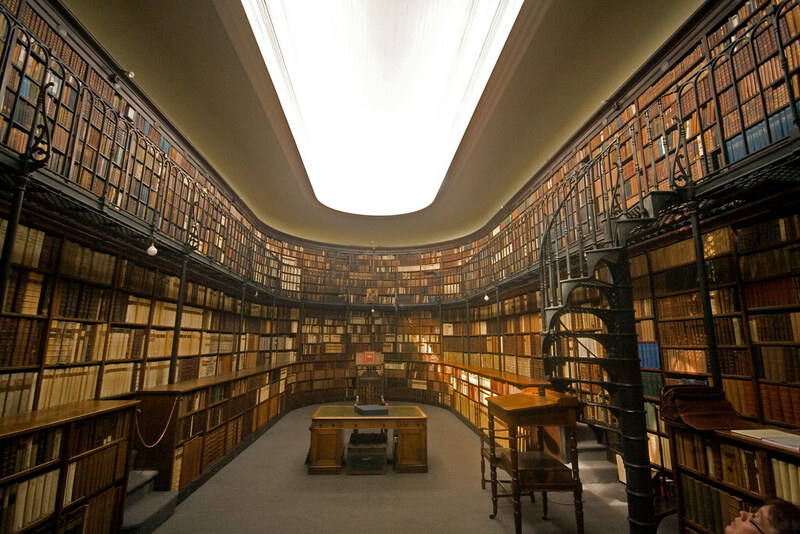 John Berg, in his library at the Apostolic Palace. Fr. Berg had the opportunity to speak privately with the Holy Father during about 15 minutes and to thank him for all that he has done for the FSSP and for the Church. 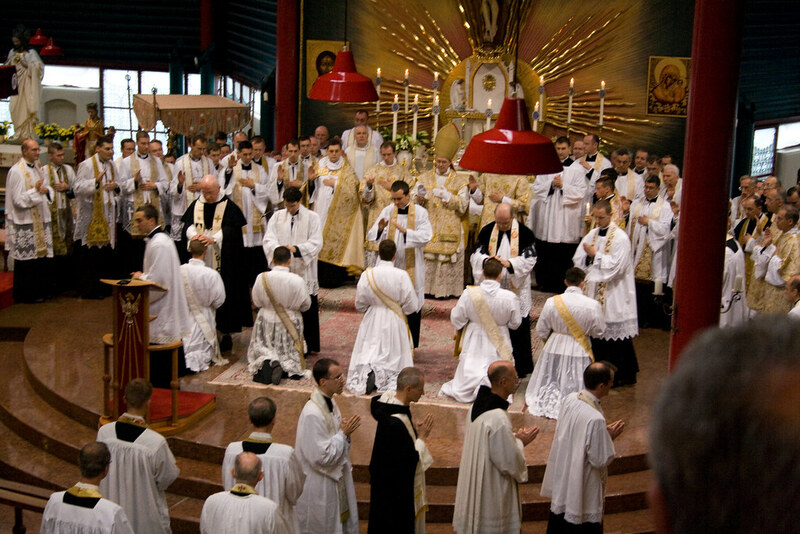 After hearing about the work being done at the seminaries and apostolates (in 115 dioceses worldwide) of the Fraternity of St. Peter, Benedict XVI encouraged its members "to remain ever faithful". Following this meeting the Holy Father greeted Fr. Bisig and the other founders of the Fraternity of St. Peter who had come for the occasion and imparted his blessing upon them and all of the members of 350 members of the FSSP. 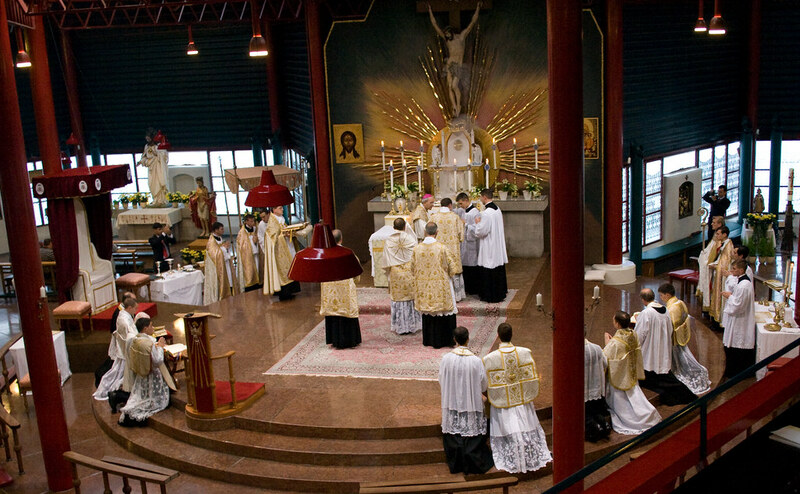 No doubt the 2,600 members of the Confraternity of St Peter will have been included in this blessing, and generally all those - whether laity or clergy - who generously support the FSSP's ministry. The meeting took place on the 21st anniversary date of the audience of the Founders with John Paul II at the Apostolic Palace. 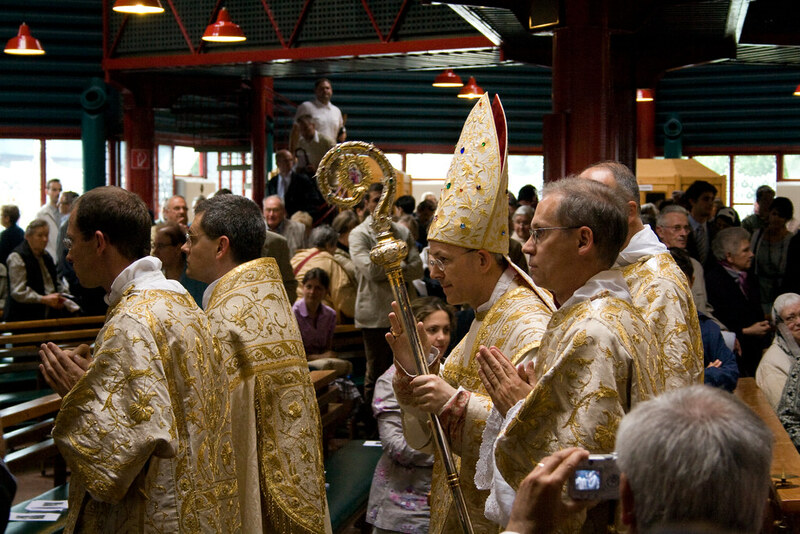 A gesture of encouragement to the FSSP - the largest EF priestly community in full communion with the Catholic Church - this audience also demonstrates the personal interest which the Holy Father takes in the matters linked with the Roman traditions of the Church and with the fruitful implementation of the Motu Proprio Summorum Pontificum. In England the FSSP is based in Reading, Portsmouth Diocese: 179 Elgar Road, RG2 0DH, Reading, Berks., England - Email: malleray@fssp.org. I blogged on this in March, but now we have entered the pilgrimage season more events have been confirmed. Mass at 1.00pm Talk at 3.00pm followed by Rosary and Benediction. 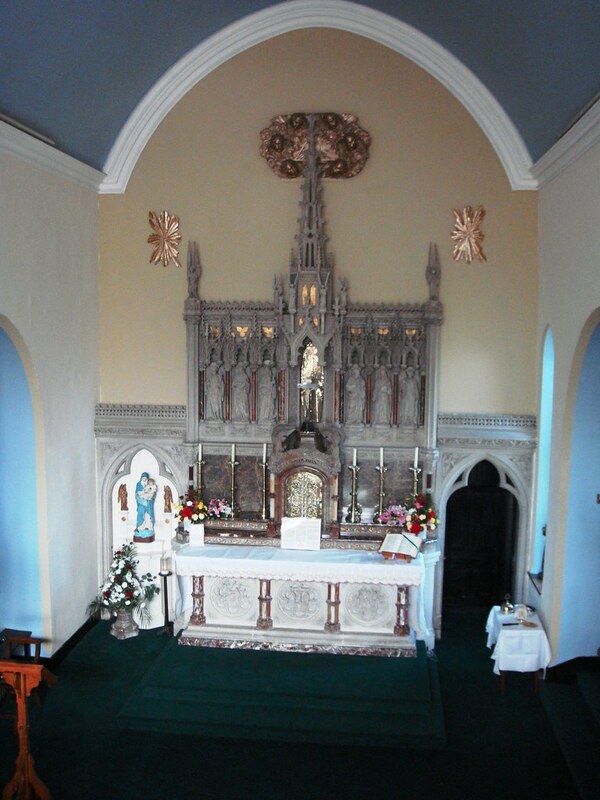 I've recently been sent photograps of the LMS Pilgrimage to Caldey Island, and the refurbished chapel of the new community at Lanherne in Cornwall, of the Franciscan Sisters of the Immaculate. For more on the convent, see this article from Mass of Ages. This reletively new order have taken over this former Carmelite convent. 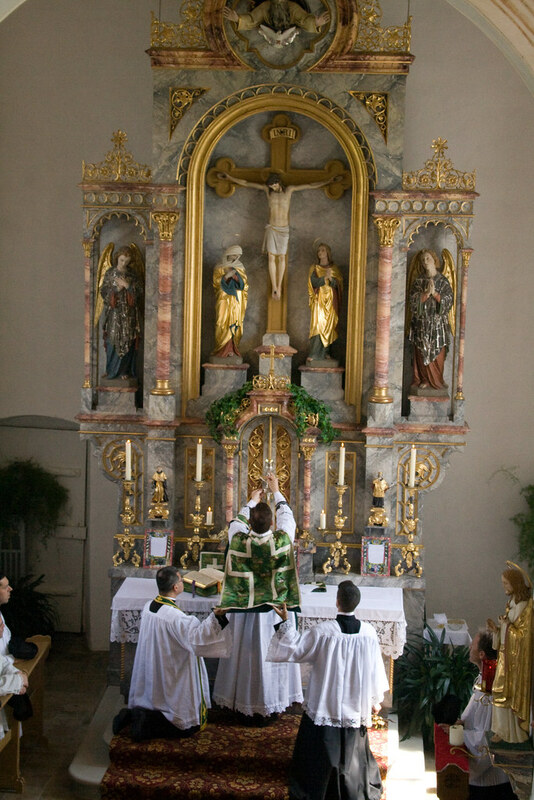 They are fully committed to the Traditional Missal and Office, and have now put the altar of their chapel back against the east wall. 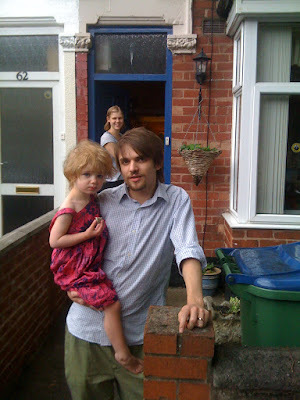 Thanks to Martin Gardner who took this photograph and others which can be seen here. 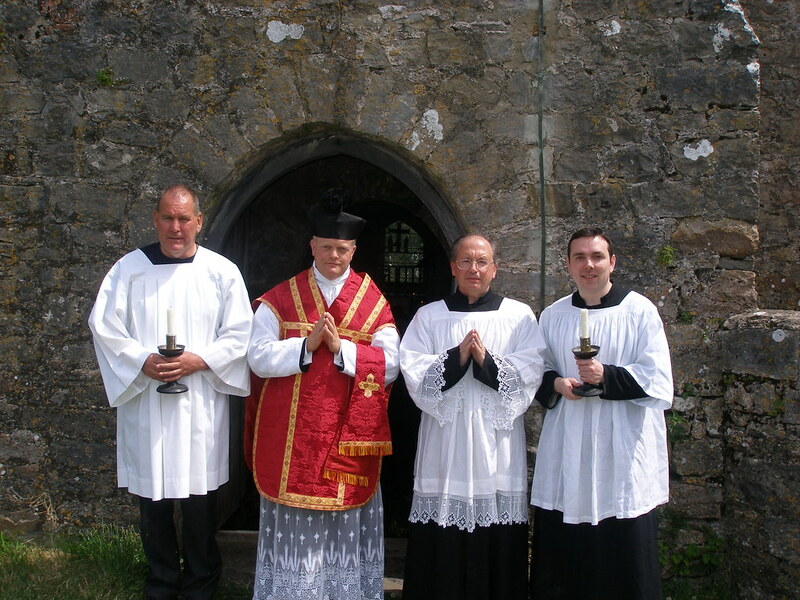 In the meantime, the Latin Mass Society Pilgrimage to another very interesting monastic centre, Caldey Abbey on Caldey Island, has taken place. 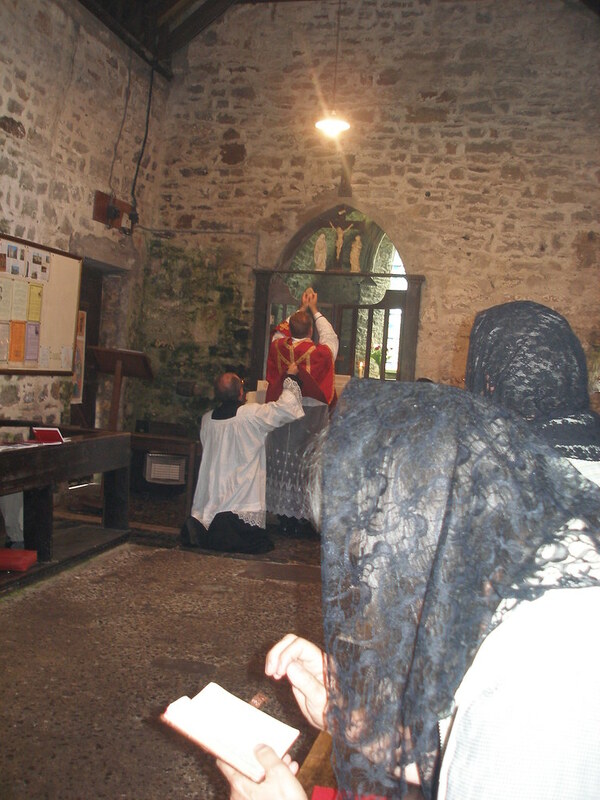 This was the first Traditional Mass to be celebrated on Caldey Island in c.40 years. The Feast was the Most Precious Blood and the celebrant was Fr Jason Jones of Our Lady of the Taper, Cardigan. Thanks to Steffano Mazzeo, the LMS local Representative who organised the event. More photos here. 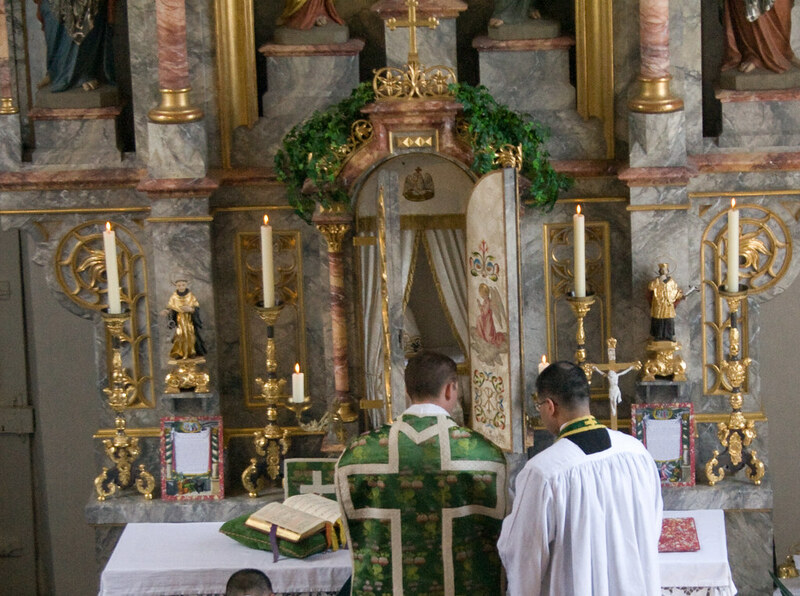 Yesterday there was celebrated what I believe to have been the first Traditional Solemn Mass celebrated on a Sunday in an Oxford church. This is a tremendous breakthrough for the integregration of the usus antiquior into parish life in Oxford. 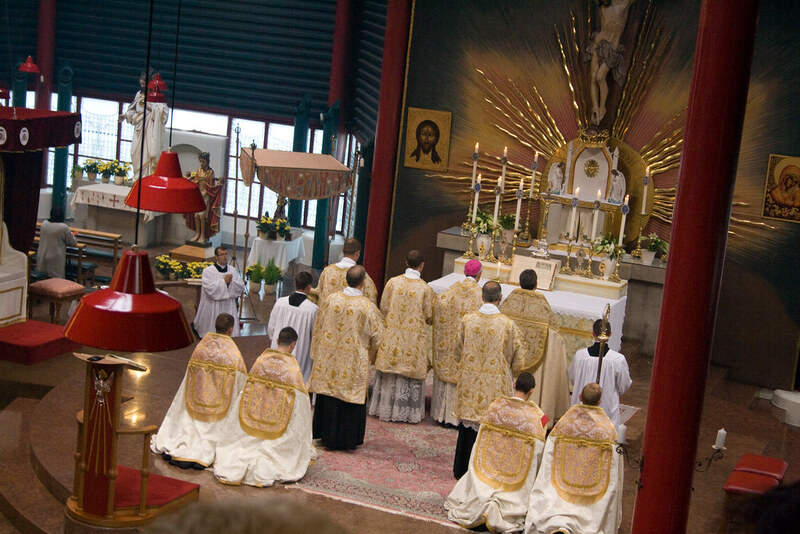 The Church was SS Gregory and Augustine, and the occasion was the visit of a touring Polish choir, the Pueri Cantores Plocenses. Fr John Saward, Priest in Charge, was the celebrant; Mr ; the Subdeacon was a visiting Benedictine monk, Dom Bede Price, of the Abbey of St Louis, Missouri. The Pueri Cantores numbered more than 40, and took up much of one side of the nave. 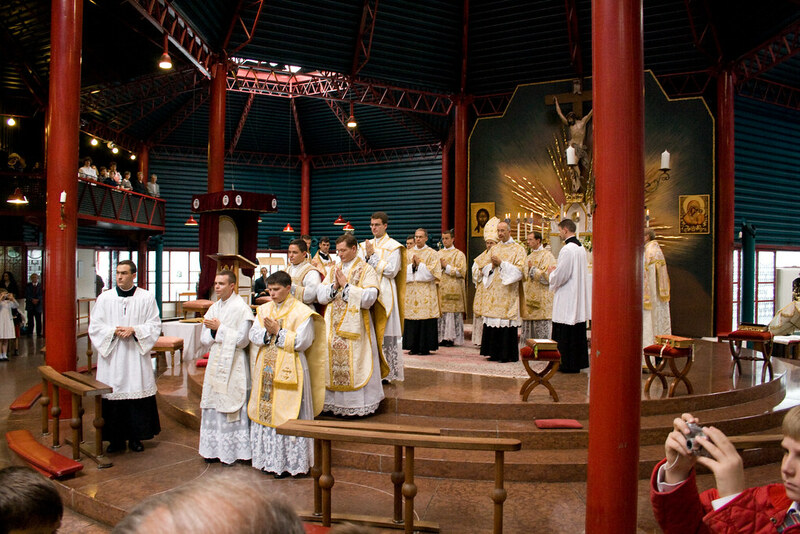 They were supplemented by a small Gregorian Schola for the propers. The choir sant Byrd's Mass for Four Voices quite beutifully. 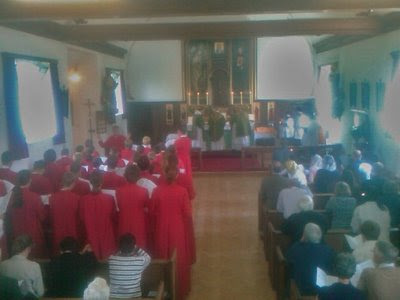 The church was packed, with many people joining the schola in the choir loft and others standing at the back. 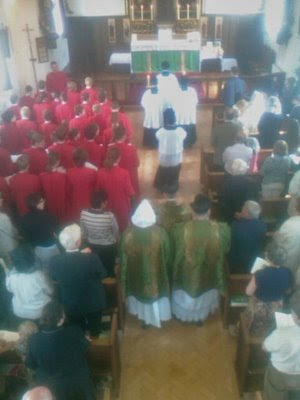 Let us hope this is but the first of many Sung and Solemn Masses in Oxford on Sundays! I'm sorry that technical mishaps left me only rather inferior photographs. 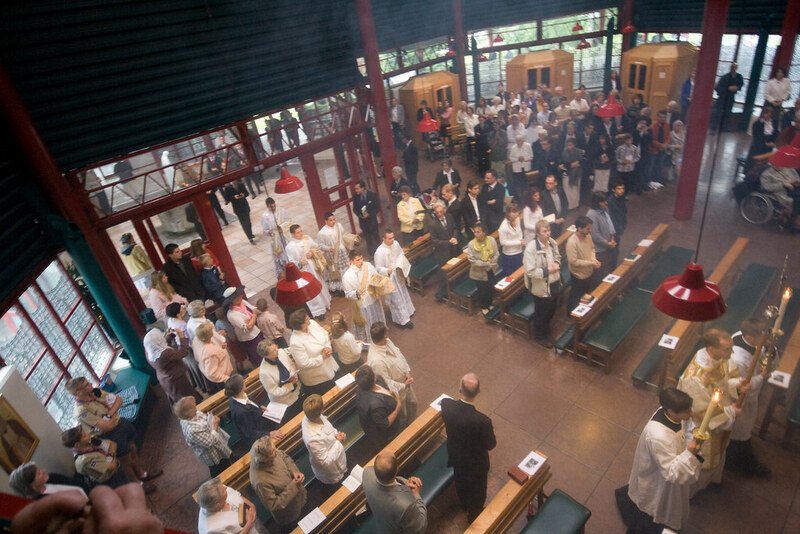 After the ordinations on the Saturday, the British contingent attended Fr Barker's first Mass on the Sunday morning. This was in an exquisit Baroque church a couple of miles from Wigratzbad itself. 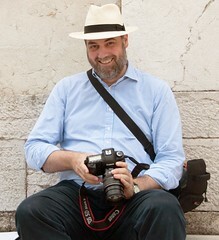 The full set of photographs can be seen here. Note the angels painted on the inside of the tabernacle doors. 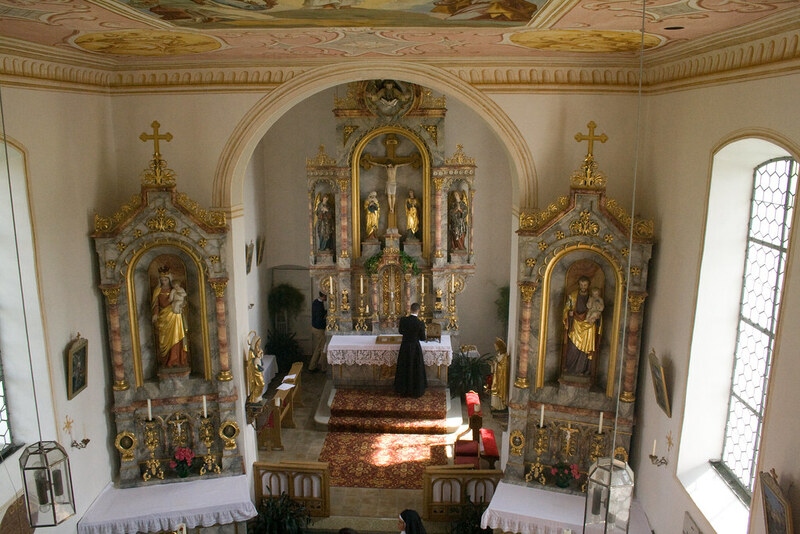 Note the houselling cloth on the altar rails. 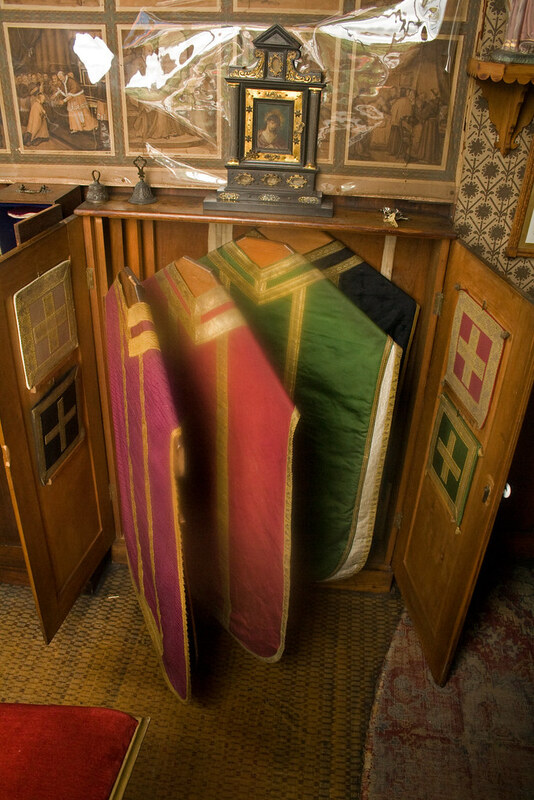 They also used a houseling cloth at the ordination Mass, when the ordinands were given communion not at the communion rails but in front of the altar. The cloth was stretched between two acolytes and formed a sort of temporary railing. I was in the choir loft. The church was packed. Coming back to the UK from Wigratzbad I immediately went on holiday, so these pictures have been delayed. But here they are at last. The full set is here. Before the ordinations, Fr Simon Leworthy FSSP running to the church in the pouring rain. It rained one and off all day. The sacred ministers reach the altar. The ordinands lying before the altar. Bishop Shneider lays on his hands. So do the other 65 priests present. The ordinands are given their chasubles, pinned up at the back. Their hands are annointed, and bound together. Mass resumes, with the ordinands assisting. Bishop Shneider gives the ordinands the kiss of peace. 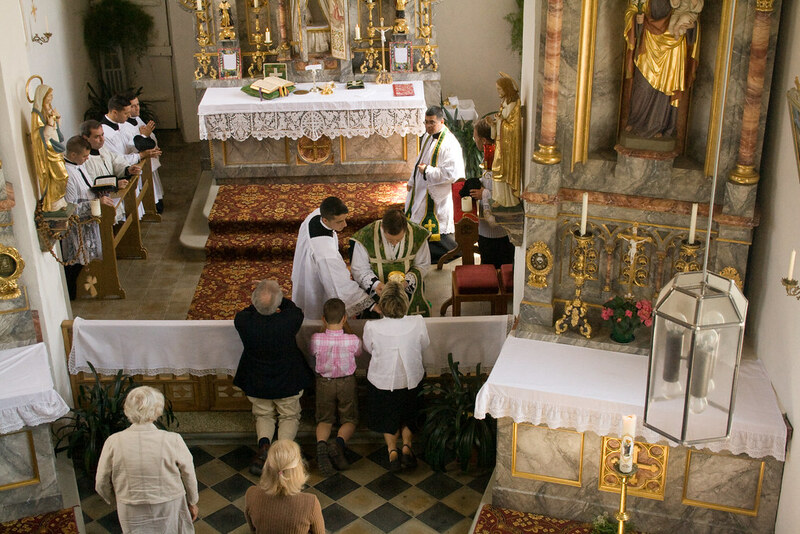 They prepare to process out of the church. 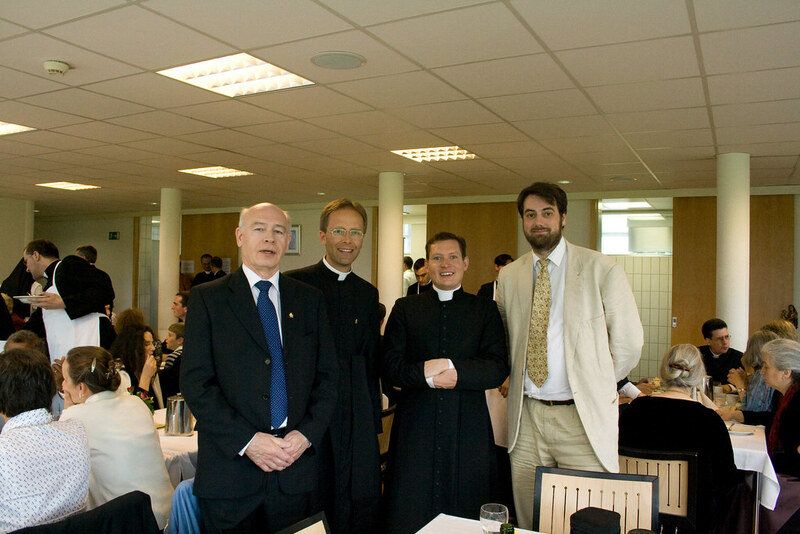 During the lunch afterwards, Fr William Barker stands between me (right), Leo Darroch, Presidenet of Una Voce International (left), and to the right of Fr Armand de Malleray FSSP, who is based with Fr Leworthy in Reading.